The Carer's Allowance team are currently running Assisted Digital pilots in Preston and Croydon and the user researchers have been in attendance at both locations helping to understand why people need assistance (it's not always about digital literacy) and looking for opportunities to improve both the current digital service and future assisted digital services. We're working with the Land Registry team on an alpha project. 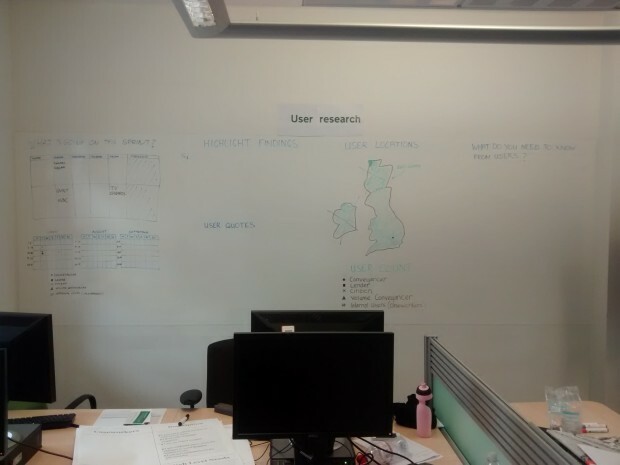 First things first, claim a wall for user research and start thinking about what information to share! Here's the first iteration. We think watching research is productivity! All this jibber jabber's not useful to me. Just a sample of what we've been up to. Have a great weekend and we'll be back with more next week.